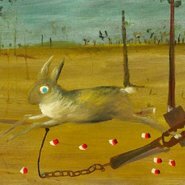 Celebrate the centenary of Sidney Nolan’s birth with a tour through the special display of Nolan’s works drawn from the Gallery’s rich collection. Explore the artist’s innovative practice and discuss his contributions to Australian 20th-century art. This program occurs seated in the gallery. Sighted companions and guide dogs are welcome.